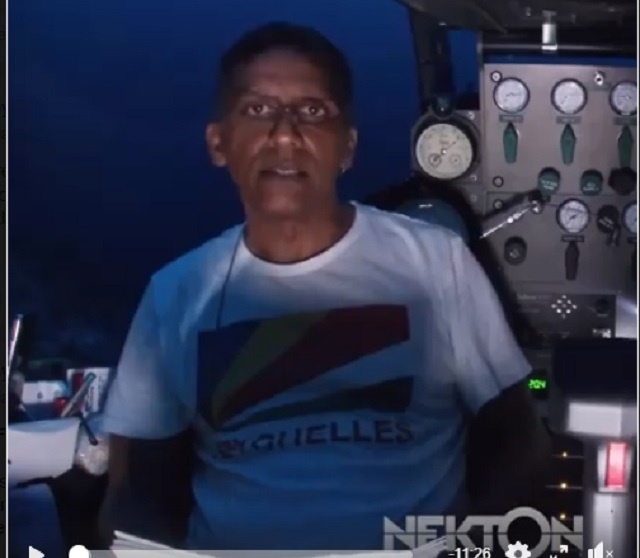 (Seychelles News Agency) - The President of Seychelles, Danny Faure, became the first head of state to deliver a live address from a depth of 124 metres below the ocean surface during a submersible dive on Sunday. According to State House, Faure joined the Seychelles Nekton expedition on Saturday at Desroches Island where he received an update on the findings of the expedition so far. In his address, Faure described the ocean as ‘the beating blue heart of our planet’ and the experience as ‘so, so cool’ and that it has made him an even stronger advocate for ocean conservation and taking concrete actions to mitigate against climate change. “Over the years, we have created these problems. We can solve them. We must solve them. We need decisive, coordinated international action. The deep ocean is the beating heart of the planet, yet we have better maps of planet Mars than we do of the ocean floor. This needs to change, as we gather the information available to identify priority areas for protection,” said the head of state. When he joined the Nekton expedition on Saturday, Faure viewed a short film which detailed the findings of the ‘First Descent’ since it was officially launched on March 2. Supported by an alliance of 40 partners, ‘First Descent’ refers to a series of expeditions to explore and conserve the Indian Ocean, the world’s least understood and least protected ocean. The Seychelles Nekton mission so far has included 75 submersible dives, 300 science deployments and the use of 21 different research technologies. The Nekton expedition is on an underwater exploration of depths of up to 500 metres of Seychelles' waters. The focus of the research is variability in trophic signatures of zooplankton and food web dynamics within the Exclusive Economic Zone of 1.4 million square kilometres of Seychelles, an archipelago in the western Indian Ocean. Ocean Zephyr -- the expedition ship which is a floating research station -- set sail from Seychelles on March 4 for the two-month expedition with seven Seychellois researchers. On his visit, the President met with Sheena Talma and Stephanie Marie, who are both working in the wet lab on board the Ocean Zephyr. Faure congratulated the two young women on their achievements and encouraged them to continue working hard and inspiring young people to pursue a career in marine science. Nekton Deep Ocean Exploration based in Oxford is backed by various partners, including the UK Government, Omega, Kensington Tours, University of Oxford, International Union for Conservation of Nature (IUCN), Sky and The Associated Press. The Associated Press is also accompanying the expedition and is providing live underwater video from the dives, using new optical transmission technology to send footage from the submarines to the ship and from there, by satellite, to the world.